Let me be clear: this tradition takes a lot of work. It typically takes me 2-3 hours one evening to sit down with the calendar, stack the books in order and get them all wrapped up. In some ways it's a bit of a pain. But in most every other single way, it is a delight to be able to do this for my kids and I can't recommend the practice highly enough. It is something that they look forward to and, truth be told, I do also. (Because I forget which order I have placed the and sometimes I'm surprised myself! Such is my memory.) Ha! All of the above titles are still included in our collection. That said, at the end of last year I culled our stack a bit, eliminating some titles that I didn't care for as much. At the beginning of this year, I replaced some with new titles I had researched. 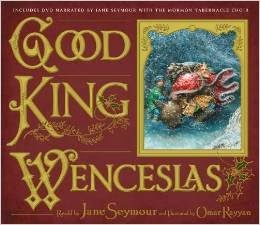 Good King Wenceslas was one I researched a bit. 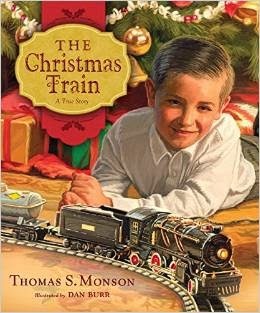 My kids especially love books which invite you to sing and I wanted to find a book based on a lesser-known-but-still-familiar carol. I know the song of Good King Wenceslas but I don't think I've ever paid much attention to the words before. I found this edition on Amazon and liked the classical look of it. We read it for the first time the other day and I absolutely love it. You do sing the song as you read the book but the verses are broken up and mixed into the story of the Good King who sees a peasant gathering wood for a fire. The king and his page boy go out to help the begger and take him some food. The king spends an enjoyable evening with the "least of these" in this kingdom before returning to his palace as the song and story go. And, as I say, as you read along the story you pause to sing the various verses. This book includes a DVD which is narrated by Jane Seymour and sung by the Mormon Tabernacle Choir. I can't tell you how the DVD is because I couldn't bear the Amazon price for the book. I purchased this one through a third party seller on Amazon but the DVD was not included. (The price, however, was more to my liking!) I'm glad I picked this one up. I think it's a great addition to our collection. This book tells the true story of a little boy who was given an electric train from his parents for Christmas. His mother has also purchased a wind-up train to gift to a neighborhood boy who is "less fortunate" then he. When he discovers the gratitude which exists in the friend who has a mere wind-up train, he feels remorseful over his own attitude of greed. Now, I'm not a proponent (in the very least) of making anyone feel guilty for receiving good gifts. I hope I give my children good gifts and I trust they will enjoy them as they should. There is nothing wrong with the giving and receiving of good gifts. (I've already argued this.) I like this book though because the message is delivered in a way that doesn't beat you over the head with false guilt, but makes the reader to know that they ought to be thankful for everything that they have received. The message isn't, "Oh, he got a simple train and you got a fancy one. You should give yours away." Rather, the message is: "Maintain a proper attitude concerning what you have been given." Give and receive, but do both joyfully! This is a lesson I hope that my children learn well in this life. We should always look to bless and receive the blessings with thanksgiving. God is generous to us and we, in turn, ought to be generous towards others. These are the messages of this book and so I love it. I whole heartedly love it and am happy to have it among our collection. Now, just because we have a nice collection of books doesn't mean that I'm necessarily done with my set. There are still books among my stack that I would weed out if I were to come across a better one. I'm always up for suggestions! 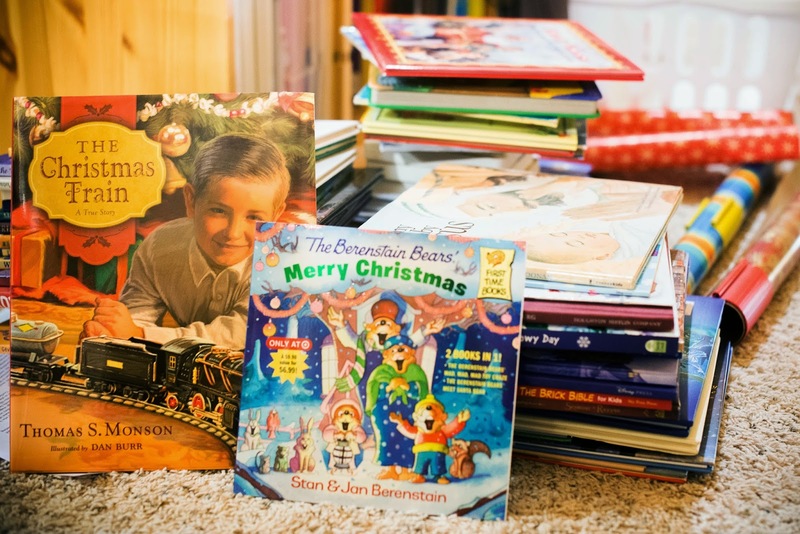 If there is a Christmas picture book that you and yours have loved, please tell me about it! I'd love to hear from you in the comment section with recommendations of your own. In the meantime, I hope you all are having a fun December celebrating time with your loved ones and are pursuing a few fun traditions of your own. This is a great idea. In fact, your post about it a couple years ago inspired me to do the same. 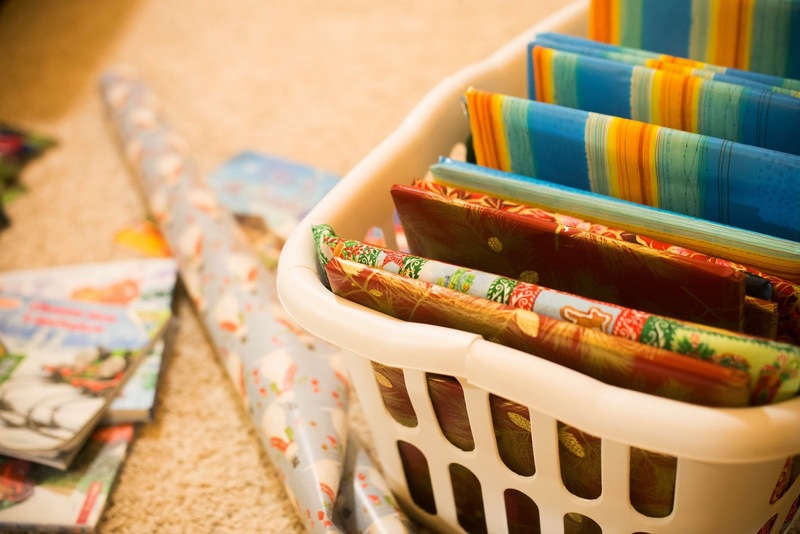 My modified version the last two years was to "wrap" a book each day in a Christmas pillowcase (to save the time and trash of paper wrappings), and the older kids would take turns each day opening the book. I'm not as on the ball this year in terms of preparation, so I've just been pulling out a couple Christmas books every few days to freshen up the reading pile. That's working well for us right now! I like the idea of coordinating the activities with the book, too. I don't know if I'd wrap them - I'd probably just rotate them - but I can imagine it does give them a thrill to be able to unwrap something each day. I'll have to keep these titles in mind for when T gets a little older. This is such a great idea! I started collecting books to have enough for each day(I think a couple of years ago), and more recently realized I had a bunch of junk books. I only kept our favorites and they're in a basket in our living room. I'd still love to do this eventually, though! I imagine there are lots of special memories happening.